Above: The dude with the beard in the center is Aldo Fiordelli, food critic for L’Espresso. In the corner you can see acclaimed winemaker Mario Pojer (curly hair, mustache). They were just a few of the high-profile writers and wine professionals in attendance. 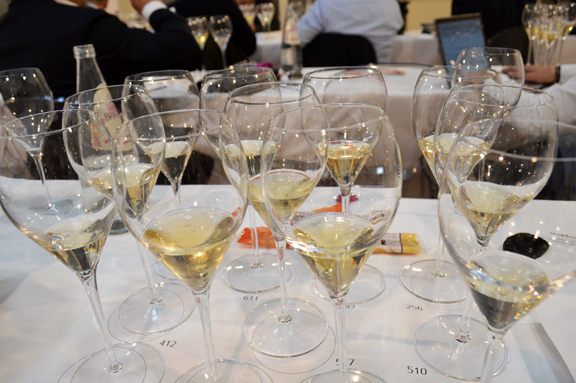 When Alessandro Morchetti, a contributing editor of the popular Italian wine blog Intravino, first contacted me about participating in the site’s “Judgment of Verona” blind tasting of Franciacorta and Champagne, I was more than reluctant. First off, I am not a fan of blind tasting. I recognize its value as an exercise for professional tasters. But I believe that. more often than not, it represents an expression of virtuosismo and an application of one-uppersonship. Secondly, I believe that comparing Franciacorta and Champagne is apples and oranges. The only things that the two appellations have in common are the grape varieties and the vinification method. And even in their overlap, they are vastly different. It seemed to me that it would be an exercise in futility. Above: It was remarkable to have such high-quality and expensive wines to compare to one another. But by the time the wines were revealed, I realized that the tasting represented a truly unique opportunity. And frankly, the only way to do a tasting like this was blind: Had we been privy to the labels, our judgment would have been clouded — blinded, really — by the marquee names that we before us (2004 Grand Année Bollinger, anyone?). I’ll probably never get to taste such high-end Champagne side-by-side with Franciacorta again, I thought to myself. But more importantly, the tasting showed me how easy it is to discern Franciacorta from Champagne. The Franciacorta lots were easy to identify thanks to their transparent fruit in the mid-palate, as they say in enoic parlance. Nearly all the wines were nine, ten, and eleven years old. When it came to the Champagne, there were clear signs of oxidation in the wine while the Franciacorta retained their freshness (one of the hallmarks of Franciacorta, in my experience). All in all, even though the scoring varied wildly from pundit to pundit, it was an extremely interesting tasting. The intention may have been to discover which appellation is “better.” But the result was that the two appellations are so different that they really can’t be compared one-on-one. That was my take, anyway. You can view the flight of wines and the scores on the Intravino blog. While I can understand why the author doesn’t like blind tastings, I feel, in this sort of setting, that a true blind tasting is necessary. That said, all contributing panelists should have some sort of uniform blind tasting experience (e.g. WSET or Master Court of Sommeliers). Blind tasting is first and foremost a very humbling exercise. The whole idea of “one-upping” people in a blind tasting is the equivalent of begging to meet the same end as Icarus. To be able to truly judge wines, one needs extensive experience blind tasting that provides them the (potential) ability to really identify not only what a wine is and where it is from, but how it is made, how old it is, how much it costs and why. When people are assigning points to wines (especially on a vast 100 point scale), not only do I wish I knew where the points come from (how many potential points can a wine earn in how many different categories? ), but I wish I knew that the whole panel has subjected themselves to years of this masochistic endeavor that is true blind tasting (I feel this way about any entity doling out points for wines). I definitely agree that Franciacorta and Champagne can’t really be compared “one-on-one” but I would suggest that one is like the Bisquet apple (a la Calvados) and the other a Red Delicious (a la lunchbox), rather than two different fruits altogether. My two cents. Love what you’re doing for Franciacorta! Jonathan, sorry I missed this comment. Great insights and great input. Thanks for being here and making this a lively discussion. Thank you!